Spring is just around the corner, and warm weather ushers in the perfect time to get outside and tackle a new adventure. In Jackson County, Spring kicks off with competitive races and adventurous feats from trail running and whitewater kayaking, to cycling and hiking over mountains. Here are four ways to find extreme adventure this spring in Jackson County. Seven miles, 2,770 feet of elevation gain, and extremely sore legs. The Assault on BlackRock summits BlackRock at 5,810 feet, and that’s just the halfway point of the race. The trail race takes place in Sylva’s scenic Pinnacle Park, where hikers enjoy the significant elevation gain and rocky terrain of the trails in the 1,000-acre park. However, running through Pinnacle Park is an entirely different, vigorous experience than hiking. As runners weave through the spruce forests along the spine of the Plott Balsam Mountains on challenging gravel and dirt roads they’ll tackle the final summit climbing 650 feet in 1/3 mile on steep single track. Those runners who complete the race in 101 minutes, 1 hour and 41 minutes, receive a belt buckle. Learn more here and sign up for the 2017 race on March 18. The normally dormant High Falls at Lake Glenville transforms into a powerhouse of flowing water during the Thorpe Dam releases. 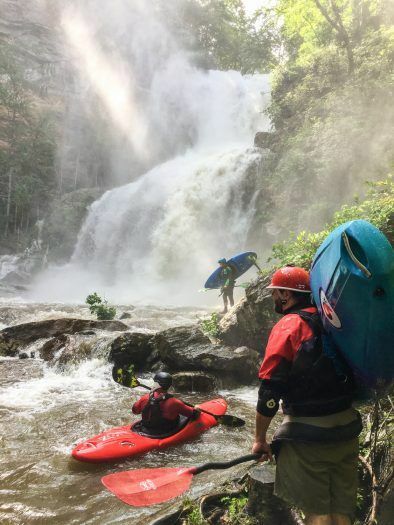 For select dates in spring and summer, Duke Energy releases the dam and water rumbles over High Falls and into the West Fork of the Tuckasegee River, giving whitewater kayakers a chance to tackle more than five miles of Class II, III and IV rapids. In order to even get to the put-in, kayakers must carry their kayaks and gear down a mile-long trail that descends about 650 feet on steep stone steps. Once kayakers are in the water and tackle the first Class IV rapid, navigating through the scenic mountain valleys is just as beautiful as it is challenging. Release dates for spring 2017 are April 8 and 9, June 10, July 1, July 22, August 12 and August 26. More information on rafting here. One of the Southeast’s most challenging century cycling rides is the Tour de Cashiers, an annual cycling race that takes cyclists through the scenic byways of three mountain counties. Cyclists will race one of three routes ranging from 25 miles, 62 miles or 100 miles, with the latter featuring more than 10,000 feet of elevation change on steep climbs and fast descents. No matter what distance, cyclists ride amid breathtaking natural scenery featuring granite-faced mountains, flowering valleys and running rivers. Register here for the 2017 Tour de Cashiers on April 29. Besides Pinnacle Park mentioned as part of the Assault on BlackRock race, the hike to Yellow Mountain Fire Tower is one of the longest and most difficult trails in Jackson County. 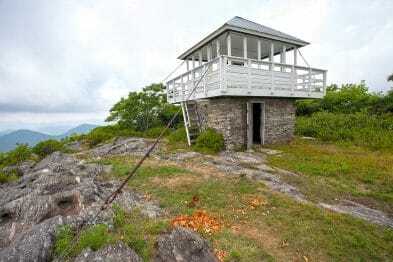 The total distance of the hike is nearly 10 miles round-trip, and ascends the highest peak of the Cowee Mountains to the historic Yellow Mountain Fire Tower. The hike includes a roller coaster-like series of climbs and descents, scaling Cole Mountain, Shortoff Mountain, and Goat Knob before the final ascent to Yellow Mountain. Hikers are rewarded with 360-degree views when they finally reach the grassy mountaintop. After a long day of outdoor adventures, explore Jackson County’s dining scene. Restaurants features locally-sourced ingredients and microbreweries offer selections of beers for any palate. Any of Jackson County’s eight towns are home to hotels, quaint cabins and cottages, vacation rentals and mountain resorts. Plan a trip to Jackson County, North Carolina by visiting www.DiscoverJacksonNC.com.